SACRAMENTO – Several Japanese Americans, including World War II veterans and citizens interned and wrongfully fired from state employment, gathered at the State Capitol on Tuesday to observe the Day of Remembrance. On the floor of the Assembly Chambers, Assemblymember Al Muratsuchi (D-Torrance) honored these individuals and led a vote on his resolution recognizing Day of Remembrance in California. Members of the Asian Pacific Islander Legislative Caucus joined their Assembly colleagues in passing the resolution unanimously. 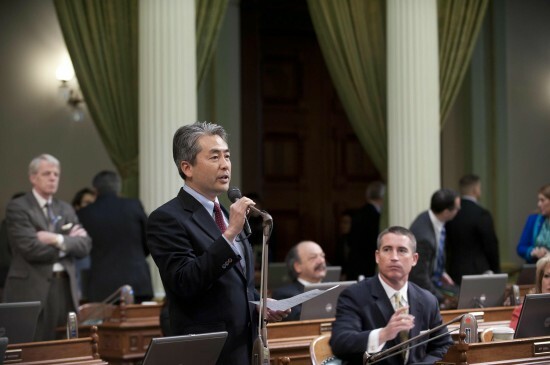 Before the floor presentation, Assemblymembers Muratsuchi, Ken Cooley (D-Rancho Cordova) and Dr. Richard Pan (D-Sacramento) announced ACR 19, the first official apology for the firing of Japanese American state employees in California. Yosh Uchida was a San Jose State University professor when he was fired because of SCR 15. 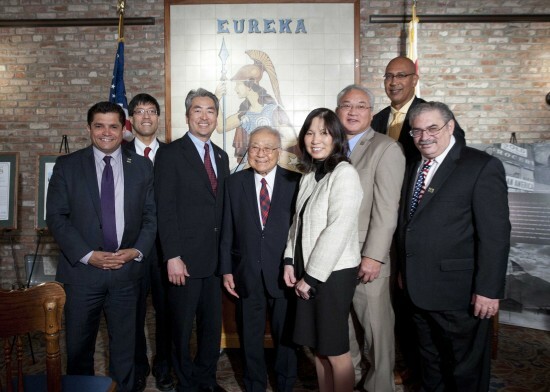 “I would like to thank these and other legislators who recognize the injustice done to the Japanese American community within the state of California and rectifying it with the introduction of ACR 19,” said Uchida, who became renowned as San Jose State’s judo coach after the war and now has a building named after him on campus. Authored by Pan, ACR 19 apologizes for the passage of SCR 15, which was authored by a World War II-era Sacramento legislator, Sen. John Swan, and passed by the 1942 Legislature. SCR 15 led to the firing of hundreds of Japanese American state employees by the State Personnel Board. As a legislative aide to then-Assemblymember Patrick Johnston (D-Stockton) in 1982, Ouchida was instrumental in securing passage of legislation that provided payments to the fired workers. On Feb. 19, 1942 President Franklin Delano Roosevelt signed Executive Order 9066, which called for the imprisonment of all Japanese Americans on the West Coast. The federal Civil Liberties Act of 1988 apologized on behalf of the people of the United States to the Japanese American community, and provided financial restitution to former incarcerees. Despite having family members sent to internment camps, 33,000 men of Japanese ancestry volunteered to serve on the battlefields of Europe and the Pacific. The segregated 100th Infantry Battalion/442nd Regimental Combat Team was among the most decorated units in U.S. military history, with 52 members earning the Distinguished Service Cross, and 21 earning the nation’s highest military decoration, the Medal of Honor. The Nisei of the Military Intelligence Service were invaluable as translators and interpreters both during the war and the postwar occupation of Japan. The Day of Remembrance resolution was supported by numerous veteran groups, including the American Legion, AMVETS, the California Association of County Veterans Service Officers, and the Vietnam Veterans of America. “On Feb. 19, 1942, President Franklin D. Roosevelt signed Executive Order 9066, which set in motion the forced evacuation and incarceration of many thousands of loyal United States citizens solely by reason of their Japanese ancestry. “That thousands of Japanese American citizens were wrongfully interned in American concentration camps without charge and without a fair hearing continues to trouble the conscience of this nation. The internment of Japanese Americans should serve as a powerful reminder that in defending this nation and its ideals, we must do so as faithfully in the courtrooms and the public squares of this country as upon the battlefields. “In spite of the terrible ordeal of internment, Japanese Americans remained steadfastly loyal to the United States throughout World War II. Even as thousands lost their homes and their economic livelihoods, many thousands of young Japanese American men bravely took up arms and sacrificed their lives to defend this country. Although the national government’s fidelity to the ideals upon which it was founded lapsed during the war, the unshakeable faith of Japanese Americans in those same ideals did not. “On Feb. 19, I ask that all Californians join me in solemn remembrance of the issuance of Executive Order 9066 on Feb. 19, 1942. I similarly ask that all Californians commemorate the rescission of Executive Order 9066 by President Gerald R. Ford on Feb. 19, 1976.